Perth's favourite Blues Siren, Harry Deluxe, promises to bring her most decadent and dangerous self to the Album Launch of Mama Red & The Dark Blues. I, for one, ain't missing out on this. "Smooth with a bit of sass. Delicate harmonies against badass bass." "Driving bass and dark guitar riffs. Sultry vocals with power passages." Harry Deluxe IS Mama Red, not so much a character, but instead a "deeply buried part of Harry's soul, that is now coming out to dance with the devil. In her sexiest shoes." She brings with her some incredibly talented musicians and instrumentalists, all of whom hail from different musical learnings and leanings, but whose collaboration and renegade spirit have created the Dark Blues. 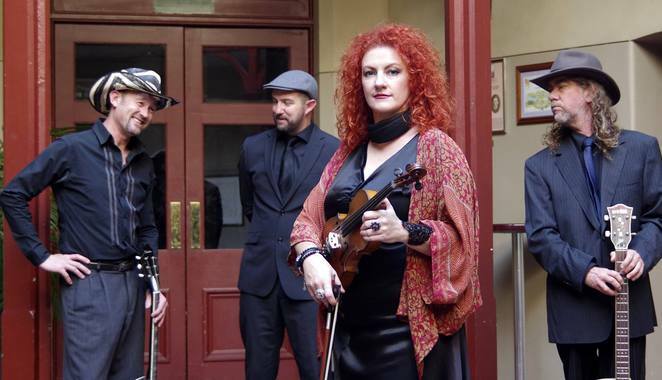 The album is the culmination of many years of collaboration between Perth writer Melanie Bainbridge and powerful performer Harry Deluxe; partners in music and soul. The Wages of Sin sings straight to the hearts of those who have wrestled with the wrong relationships, waded through self-doubt and addictions and who have come out the other end with grace and a story to share. Y'all need to come listen. See you at The Ellington Jazz Club on Friday 1st of July at 7pm for Opening Night and the Launch of The Wages of Sin. Tickets can be purchased at The Ellington Jazz Club. Do get a move on, they're selling out fast.